A great all round printer that gives the lowest running costs we've seen in A3 printers. Its quality is slightly lower than the top recommended A3 printer, but it is still a solid choice. 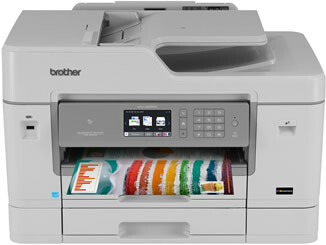 An excellent alternative to our top rated A3 printer, the HP Officejet Pro 7740, this Brother MFC-J6935dw gives you significantly lower running costs at a slight loss in performance. It's a fantastic all round machine though and a brilliant A3 alternative if the HP machine isn't your top choice. A great feature of this printer is the ADF supporting single-pass auto-duplexing for two sided copying. This gives you super fast scanning if that is important to you. If you don't even want a scanner, copier or fax, take a look at the MFC-J5930dw instead, essentially the same printer without those features. 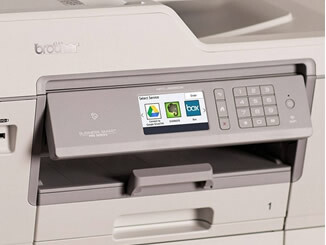 The MFC-J6935dw also has Brothers range of security features allowing you to lock permissions or print volumes by user. No more pesky employees wasting countless pages. While the MFC-J6935dw won't set the world alight, the print speeds for an office inkjet are more than good enough. It has a decent "time to first page" of close to 8 seconds, making it suitable for offices who only do 1 or 2 page prints every now and then. For larger print runs you'll be looking at close to 12 pages per minute on normal documents. Full colour pages will obviously slow down significantly, but even full image prints clocking in at 85%+ page coverage will priint in around two minutes, making it nice and pacey. The quality is also very good for such a cheap to run printer. Normally you sacrifice quality when seeing such a drop in running costs, but the MFC-J6935dw manages to give strong colour reproduction in addition to crisp, accurate blacks on text. We personally prefer the final print quality of the HP Officejet Pro 7740 but both machines are more than good enough for nearly anything an office can throw at it. The MFC-J6935dw is a fairly typical inkjet printer, taking four colour cartridges of varying capacities. The lower capacity LC3217 range of inks, giving you up to 550 pages in each of the four cartridges, is a nice stop-gap if you end up with this printer without intending to use it for much printing and more for the A3 scanning functionality, but we would advise always sticking to the higher capacity LC3219 inks. These give a significantly larger yield, with up to 3,000 pages in the black Brother LC3219XL and up to 1,500 pages in the three colours. You'll enjoy much cheaper running costs, especially if you opt for the pre-made Brother LC3219 multipack. The overview of this printer mentioned value for money and boy did we mean it. The LC3219 XL cartridges give a wonderfully low running cost of 1.16p per page which is competitive with other printers anyway. However, use compatible LC3219 Brother cartridges in this printer drops that to a ridiculous 0.5p per page, incredibly low for an office inkjet. You can replace each ink as it runs out so it doesn't matter what colour you're using most, your printing will just be super cheap. Anyone who wants A3 functionality with very cheap running costs. While the HP Officejet Pro 7740 wins the overall A3 printer award, it doesn't have a patch on the MFC-J6935dw for value for money. 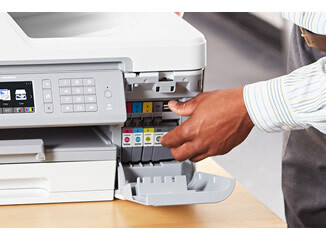 If you're after a printer without all of the functionality then take a look at the MFC-J5930dw, essentially the same printer without scan, copy and fax.